What type of classes did you primarily take in 2016? Masterclass – taught for a limited time or on an irregular basis by a visiting or unique instructor. Advanced – taught on a regular basis by local instructors, generally requiring specific dance competency prerequisites, instructor placement, or audition. Intermediate – taught on a regular basis by local instructors, and open to students with general dance background. Beginner – open to all students of any background or experience. 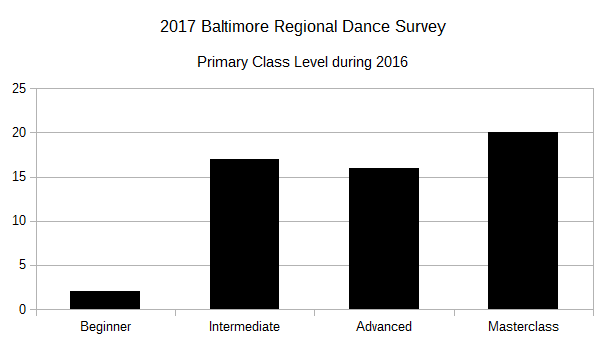 These definitions get a little awkward, because I could find no meaningful and universally-accepted definition of “class levels” that applied across dance forms, so these definitions are made up entirely for the purpose of the survey. The intent was to capture a meaningful difference at each level – if you have thoughts on how these definitions failed or succeeded, please get in touch. 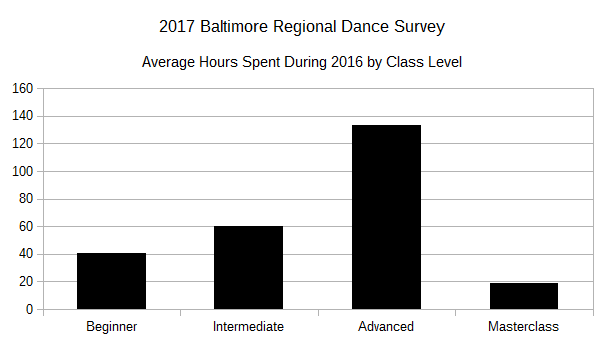 The second question on this subject was a bit challenging to complete, so there is some failure in the data – “Approximately, how many hours did you spend taking any of the listed class levels in 2016?” Since this asked the respondents to think about a whole year of experience, and do some math (3 45-minute classes each week, except summer and a couple weeks in the spring and winter is…. ), I didn’t expect high precision in the answers. I also had to toss one number that could be a user-error or computer-glitch, but I know nobody managed 100 quadrillion hours of training during 2016. 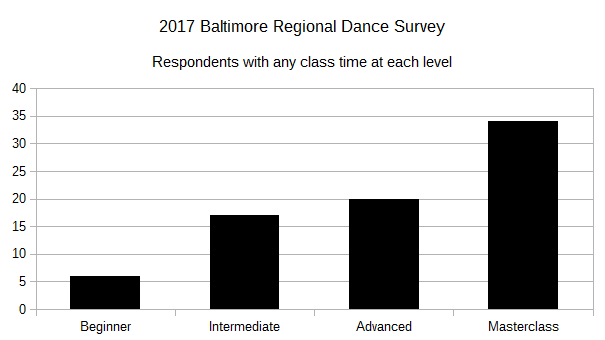 While 35 respondents considered their primary class level “Intermediate” or “Advanced” and only 20 considered their primary class level “Masterclass,” it turns out that a lot of those Intermediate or Advanced students did spend at least some time in the studio with the masters (and a few spent some time embracing their inner beginner). How much time? Within this sample, mostly “Advanced” training. But this chart has some issues that break credibility. 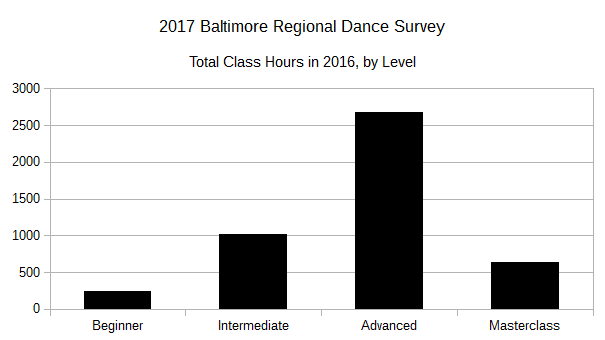 While it’s easy to understand less than 20 hours a year of Masterclass-level training (that’s a week in New York, so that could take a good chunk of a dancer’s annual training budget), it’s more difficult to understand only 134 hours/year of Advanced classes. Advanced classes are, by definition “taught on a regular basis by local instructors” – but that works out to just 2.5 hours per week. In fact, ALL of the reported training in this question adds up to just 4.9 hours per week per respondent. it is interesting that half of all training by these respondents is at the Advanced level, but is this 5-hours-per-week number reasonable? Perhaps some of this is related to the age bias in the survey (are older dancers training less? ), and perhaps some of this has to do with challenges of the definitions. When I say “class” and “taught” does that mean something new? Does it exclude regular training or performance rehearsal time? Or am I thinking too hard past the actual data? Is 5 hours of training per week reasonable for this set of dancers? If not, how can I fix this?